Dental implants are an excellent long-term solution for missing teeth and act as a strong foundation for permanent crowns, bridges, or dentures. Dental implants appear and function like natural teeth, compared to other tooth replacements, like removable partial and full dentures, or fixed bridges. A small, screw-shaped titanium post is inserted into the bone to replace the root part of a missing tooth. The procedure requires only local anesthesia. Once the implant is placed, a custom-made permanent crown is fixed over the implant as a long-term solution for your missing teeth. Replace a single tooth, restoring function and saving neighboring teeth from collapse. To learn more about dental implants, teeth cleaning and cosmetic dentistry, consult the leading dentist in Stuart, Florida; call Riggs Family Dentistry at 772-220-4171 Today. 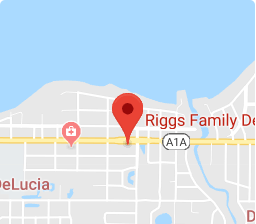 Riggs Family Dentistry is designed to be inviting, comforting, bright, and full of friendly, caring people dedicated to bringing patients the finest quality family and cosmetic dental care.